Study the two versions of the Aqua/Silver Mini-Radiant Sun Earrings. Before you read further, decide which you think works best and why. Read further and I’ll tell you my thoughts. The one on the right is the final version that I sell as a kit. Here’s why it is a much stronger design than the one on the left. I constantly stress in my teachings and writings that as an artist, its our job to visually guide the viewers’ eye and tell them where to look first, where to focus. We do this by consciously creating a focal point. Or several focal points in a heirarchal manner. Lightest or darkest areas often create focal points, as do areas of greatest contrast (lightest against darkest). Where is the focal point within the earring on the left? Finding it is a bit confusing, isn’t it? My eye is drawn immediately to the visual horizontal band created by the lightest beads, the silver beads. That horizontal band is not an aesthetically pleasing focal point. And it competes with the upper medallion section of the earring, which seems a natural focal point because of the circular shape. 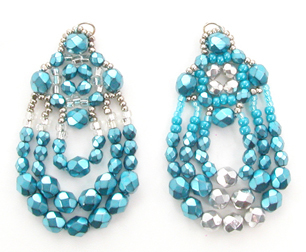 In the earring on the right, the upper medallion section features four silver beads. My eye is drawn right into that upper center, where those lightest beads are. Here the composition and the color are in agreement that this is the focal point of the earring. After enjoying the medallion focal point my eye immediately shifts straight down the middle of the earring, drawn to the light of the 6 largest silver beads that create and triangle shape. A second focal point! 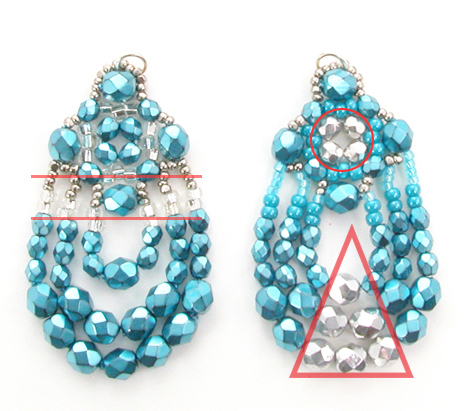 It is the lightest area of the bottom of the earring. And the traingle shape intrigues the eye, beckoning more of my attention. That is a really informative post. Sometimes a design needs a ‘rest’ before going out into the world to see what works and what doesn’t. I am sure that many people would have stopped at the original version of these earrings and not seen the potential that a slight shift in design could make. I agree that creating a focal point and leading the eye is so very important in a design. It is the difference between a good design and a great one. Thanks for sharing your inspiration, Margie! Thanks, Erin. Its true, many would have stopped at the first earring – that indeed is the difference between mediocre design and very good design. As for focal points, my eye craves them (as do most eyes). Not having one can cripple a piece of jewelry. You captured the spirit of beaders so beautifully! Beaders are a unique group. I love the sharing and kindness. One day I hope to go on a Beading Cruise 🙂 Looking forward to reading your next blog post about the experience! Thanks, Aleta – as long as I’ve been a part of the beading community (over 20 years now) I’ve been in awe of the generosity. Its magical. It changes people.